The Bahamas is a phenomenal series of islands in the Caribbean Sea located just a little more than fifty miles from the Florida coast. Its close proximity and legendary hospitality has made this island nation a popular American tourist destination. Nassau, the port city on New Providence Island, and the resort community of Paradise Island are located near some of the best Scuba Diving sites in the Caribbean. It’s tough to believe that this pristine island paradise is located so close to the U.S. mainland. You will really feel as though you are a world away from the U.S. when you dive below the water’s surface and explore an amazing undersea wall, coral reef, or shipwreck. No matter where your accommodations in Nassau or on Paradise Island are located, you’ll be near the docks where you can board a dive boat and reach a fantastic dive site within minutes. The warm waters of the Gulf Stream provide tropical weather throughout the year in the Bahamas. Due to the constant flow of Gulf Stream waters from the balmy equator, the water temps around the Bahamas stay consistently warm throughout the year. This steady water temperature, spanning from the low seventies to mid eighties (Fahrenheit), is vital in fostering coral growth. Wetsuits with a thickness of five millimeters or less will provide ample insulation for divers even during the wintertime. Divers can completely abandon their wetsuits in late spring. On a clear, placid day, visibility can eclipse one hundred feet. You’ll discover a remarkable variety of corals off the shores of the Bahamas, especially soft corals such as Sea Fans and Gorgonians. Elkhorn Coral, and Staghorn Coral as well as a colorful array of Sponges can be found in the waters off the Bahamian coast. Other aquatic invertebrates you can view include Sea Anemones, Octopi, and Nudibranches. A dizzying conglomeration of marine animals inhabit this region, including Spiny Lobsters, Sting Rays, Spider Crabs, Nurse Sharks, Barracudas, Reef Sharks, Moray Eels, Hermit Crabs, Green Turtles, Spanish Lobsters, Hawksbill Turtles, and Brittle Stars. An amazing rainbow of fish can be spied around the wrecks, walls and reefs off the Bahamas, including Silver Snooks, Blue Tangs, Yellow Goatfish, Sergeant Majors, Jacks, Spanish Hogfish, Grunts, Parrotfish, Groupers, and Snappers. 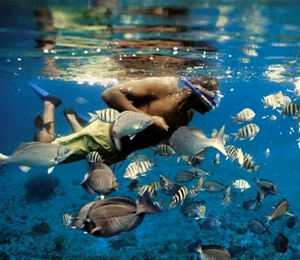 Believe it or not you will discover several different varieties of Angelfish in the Caribbean waters near the Bahamas. You’ll be able to see the ghostly remnants of wrecks off the coast of New Providence Island and Paradise Island. The sea floor surrounding the Bahamas is littered with both intentionally and accidentally scuttled wrecks. In addition to the virtually unrecognizable wrecks from the Eighteenth Century, when pirates, wreckers and privateers roamed the Caribbean, there are plenty of submerged modern tankers, tugs, fishing boats, troop transports, and even airplanes. You may even recognize some of these wreck sites from popular films, including Into the Blue, Jaws and several James Bond movies. Our expert scuba diving pros will lead you to the best Scuba Diving spots off the gorgeous beaches of the Bahamas. All of our PADI-licensed divemasters are devoted to our client’s safety as well as their enjoyment on our Scuba Diving trips. You won’t find more qualified personnel to guide you on your Bahamian Scuba adventure.